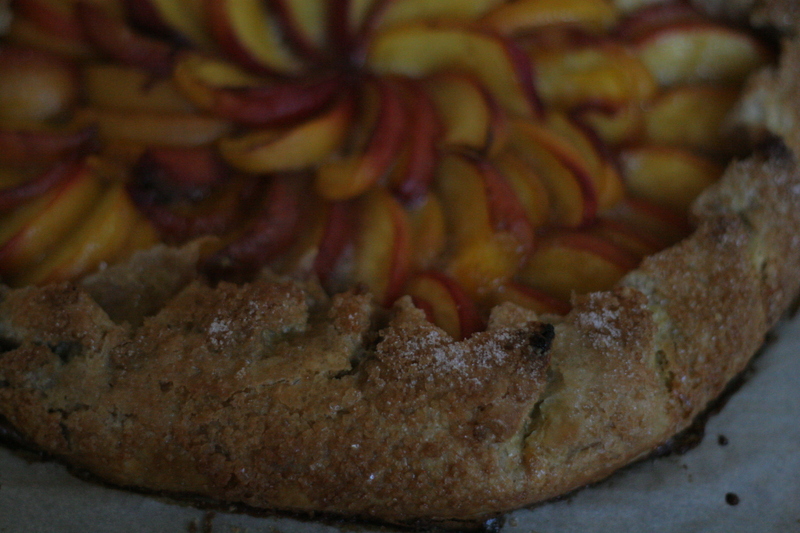 I have been meaning to share a fantastic tart/crust/pastry technique with you for a long while, but due to problems with the new camera that we inherited, have not gotten around to actually photographing it. This would make a great base for a Valentine’s Day treat. The most important part of the dough is its very simple, but magical technique. With this trick, fine whole wheat pastry flour creates a base for a juicy jammy blackberry tart that shatters into a buttery crunch of shards you can sweep into a pile of crumbs on your plate and subsequently tip into your mouth. 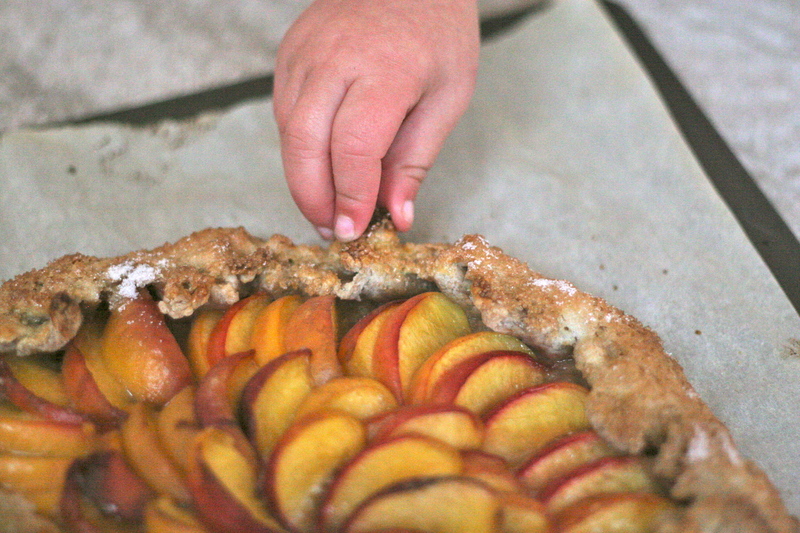 Spelt and rye flours make their way into various sweet stone fruit galettes in July and August. And though a free formed fruit tart sounds heavenly just about anytime (like a pistachio frangipane galette with pears, hmmmm), my favorite use for this pastry dough of late is in a savory tart. A couple of weeks ago we picked up a Mystery Box from Mariquita Farm and as much as I adore sweet, fragrant, and abundant summer produce, I have a soft spot for the vegetables that they grow this time of year. Spigariello, octopus-tentacled Italian dandelions, Portuguese cabbage Couve Tronchuda, Swiss chard, baby turnips, sweet and gnarled winter carrots, and knobby sunchokes. 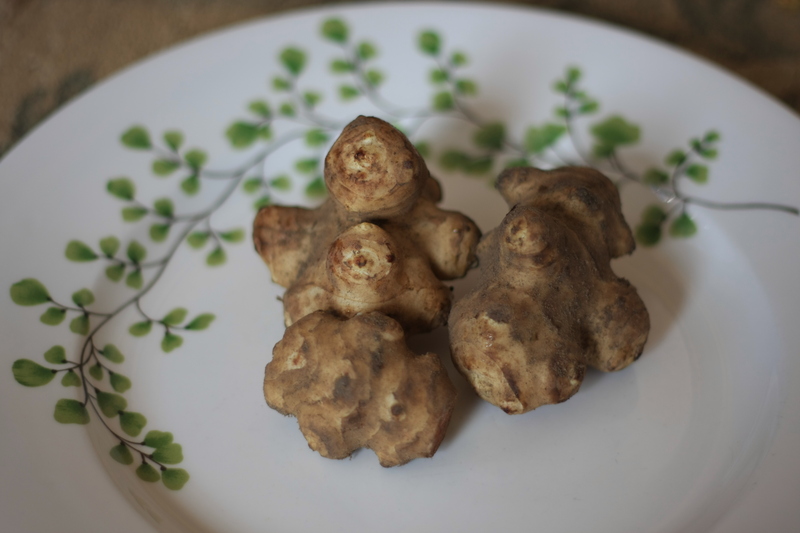 What do you do with sunchokes? I have only used them raw in salads, and they are crunchy and delicious, much like a barely sweet jicama. I have also had them thinly sliced and fried like potato chips and added to all kinds of dishes. For a couple of years I had been eying a quiche-like tart with sunchokes in the Ottolenghi cookbook, but never simultaneously had sunchokes in the fridge, until last week. Cooked sunchokes loose their grainy (but pleasing) jicama type texture and convert into a silky, firm root vegetable. It is as though it were an entirely different ingredient. I also had Swiss chard in our garden and the Portuguese couve tronchuda, many Meyer lemons, and a lot of homemade creme fraiche that I had not assigned to anything yet. And so my favorite savory tart was born. But first you need that pastry base. This technique is basically like making a really rough puff pastry dough, but with some ice water. Chilled butter layers create pockets that melt and then steam while cooking so that you end up with an incredibly tender and flaky crust. 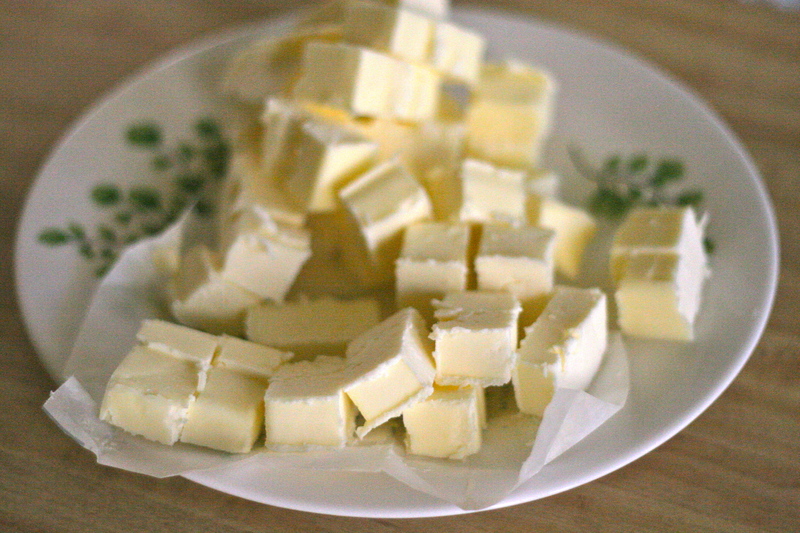 First cut your butter into roughly 1/2 inch to 1 inch cubes and set in the freezer for at least 15 minutes. While the butter is chilling, measure out your flour, salted ice water, and a little bit of a sea salt that has some panache (Maldon, grey, fleur de sel, or even a cheap coarse sea salt all do great). Sprinkle most of the flour and salt out on your work surface and spread the near-frozen butter cubes on top with just a dusting of the rest of the flour to prevent the butter from sticking to your rolling-pin too much. Start rolling. You want the butter to flatten out like little cat tongues. 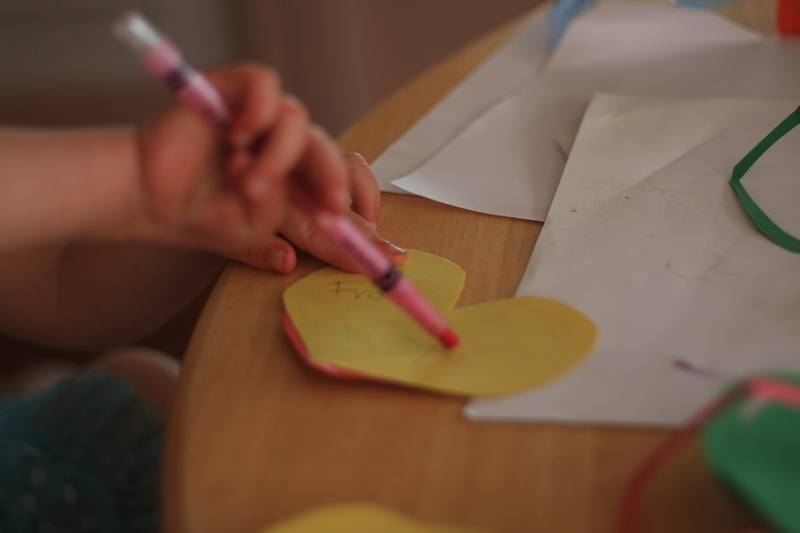 Take a spatula or bench scraper (if you have one), and scrape it all back into a pile and repeat the rolling. Scrape and roll once or twice more. Now form a little depression in the middle of the butter flour mixture and pour in your salted ice water. With your bench scraper/spatula, scrape the outsides into the liquid in the middle and keep cutting in until the whole mass becomes roughly stuck together. 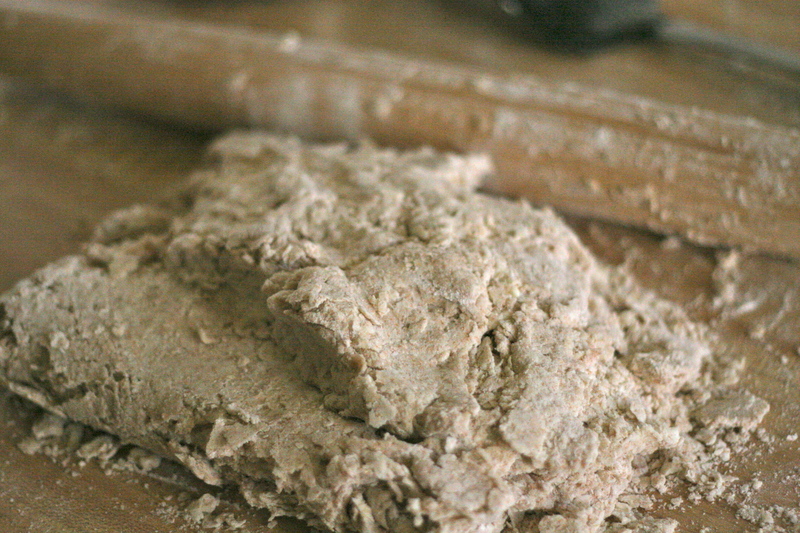 Finally, sprinkle a bit of flour and roll out the dough once more into a rectangular shape. 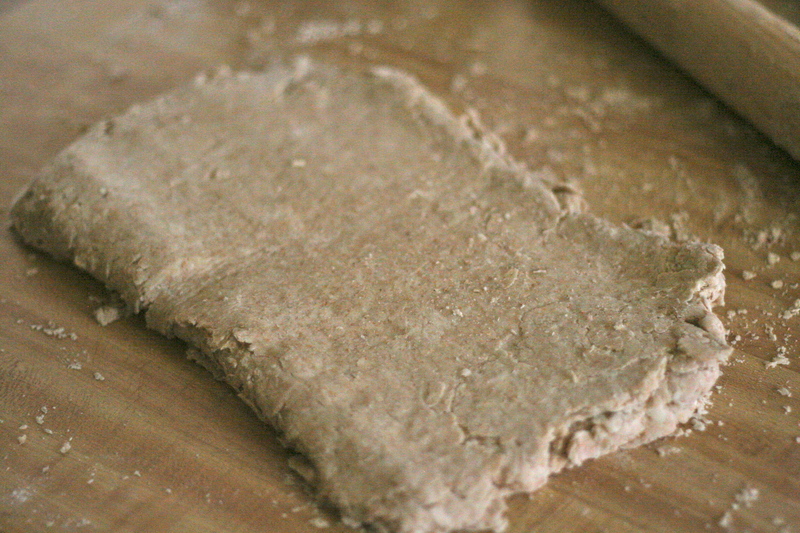 Fold in the edges, flip the dough so the smooth side is up and roll out again once, repeating once or twice. End with a nice neat folded package and plastic wrap in the freezer for months or in the fridge for 2 hours to a week before using. If you are making a free form tart, like a galette, roll it out, fill it, and let it sit in the freezer or fridge for at least 20 minutes before cooking it. If you plan on making a formed tart in a pie or fluted free bottom tin, roll out the dough and press it into the form and likewise refrigerate at least 20 minutes before cooking it. Finally, choose your cheese wisely. A really good feta cheese makes all the difference here. 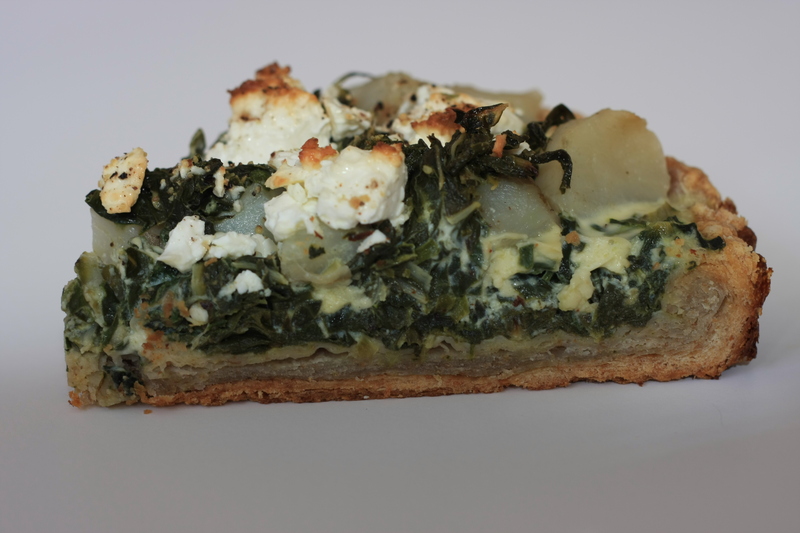 I am very fond of Bulgarian and Israeli fetas in this tart tucked in big chunks all around the top. Enjoy the best crust you will ever have and Happy Valentine’s Day! Mix the kosher salt with the ice water and keep ready in the freezer or with a couple of ice cubes in it. 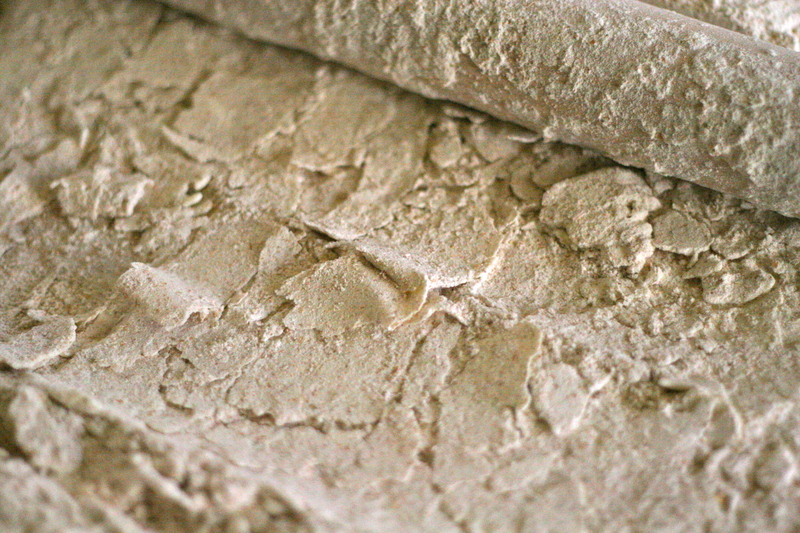 Mix together your flours and your sea salt and dump out most of it into a rectangle on your work surface. 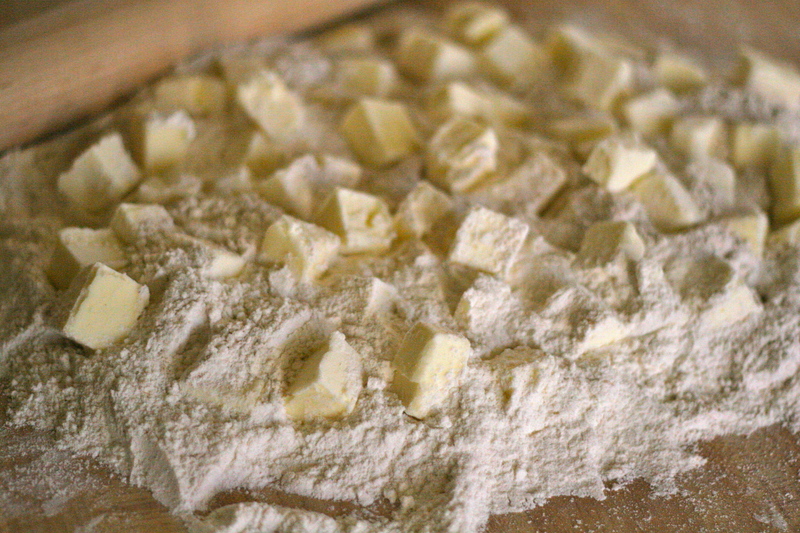 Lay the butter cubes on top and dust with the remaining flour so that your rolling-pin does not stick. Roll out so that the butter cubes begin to flatten and elongate like cat tongues. Scrape the mixture back to the center and repeat two more times. Make a depression in the middle of the flour-butter mixture and pour in the ice water. Slowly scrape the flour mixture from the outside and cut into the water in the middle and repeat until you have a nice shaggy mess of mostly uniform dough. 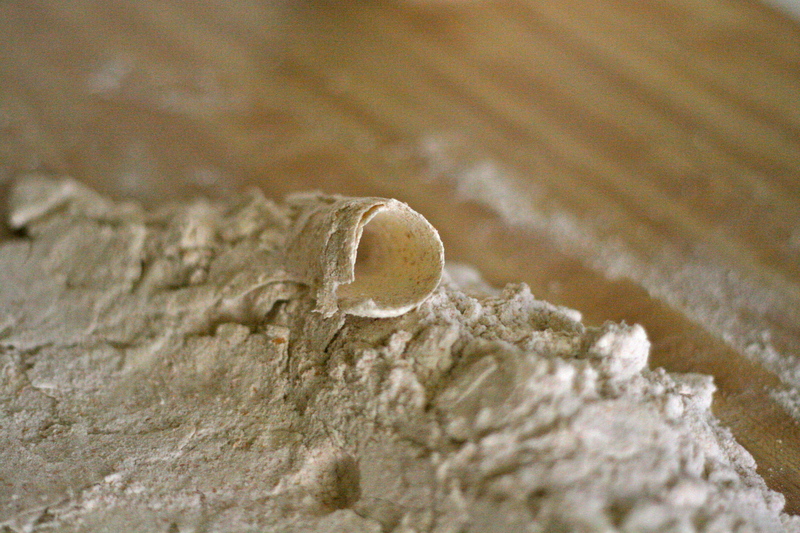 Dust lightly with flour and roll out to a rectangle and then scrape the edges back in, flip over so the folded parts are underneath and repeat (roll, fold, flip) once or twice more. Cut into two doughs. You should end up with nice cohesive pastry dough packages that you can plastic wrap and refrigerate for 2 hours to a week or freeze for a couple of months. See directions above about how to proceed if you are making a sweet (or savory) galette. While your crust is cooking, cook the cubes of sunchokes in salted water until fork tender. Drain and let cool. Prepare your chard or Portuguese couve tronchuda. Head 3-4 tablespoons olive oil in a large frying pan on medium high heat. Lay your cleaned leaves in a bed and then roll them up into a cigar shape and slice very thinly into ribbons. Chop once or twice more so the ribbons are not too long and then saute in the pan until they are wilted and have released a good deal of liquid. Turn off of the heat and quickly add 1-2 crushed garlic cloves and squeeze in your Meyer lemon juice. Let cool a bit. Whisk together the creme fraiche and eggs with a little salt and pepper. 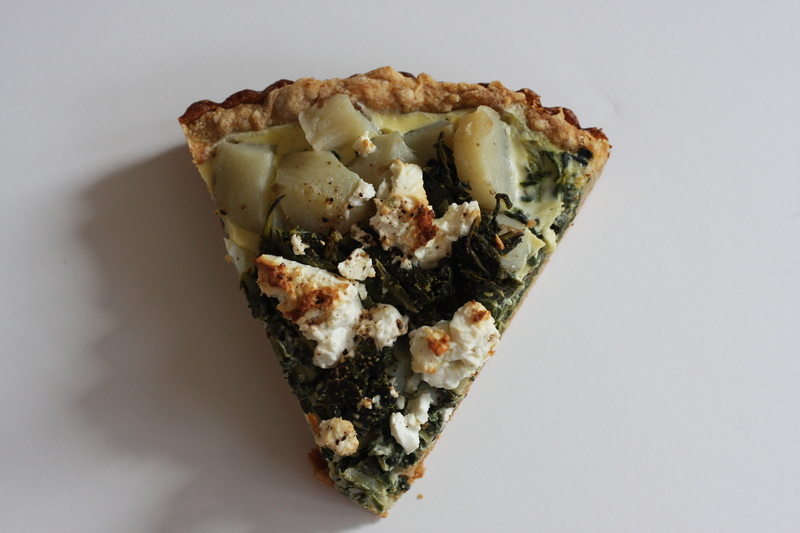 Carefully layer the sautéed chard and the sunchokes in the tart shell so that both vegetables show in different places. Sprinkle the large chunks of feta cheese on the top and finally slowly pour the creme-egg mixture in the shell so that it does not spill over the top. Sprinkle a tiny bit more salt and freshly cracked pepper on the top and put in the oven to cook for 15 minutes uncovered. Remove the tart and tent it in aluminum foil and return to the oven to cook for another 30-40 minutes, until the center is no longer jiggly and the custard has fully formed between the vegetables. If need be, you can take the aluminum foil off for the final five minutes of cooking. Let stand to cool for 5 minutes before eating, if you like it hot, or let cool for a full hour if you prefer it at room temperature. This entry was posted in Chard, Dinner, Lunch, Rustic Fruit Desserts, Savory Tarts, Whole Grains and tagged best galette dough, best technique for tart dough, Couve Tronchuda recipe, creme fraiche homemade how to use, Savory Swiss Chard Tart, Sunchoke Chard Recipe, Sunchoke recipe, technique for tart crust, Valentine Day Galette. Bookmark the permalink.